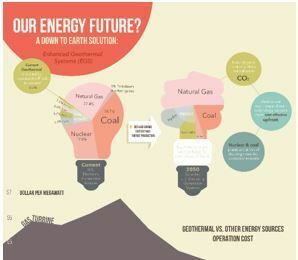 Read to learn and see how geothermal energy works. Included in this issue: activities, videos, competitions, STEM Energy 101 resources, and career ideas. Geothermal is an "always on" virtually untapped energy resource derived from the earth's heat that provides renewable power around the clock. The Geothermal Technologies Office works to reduce the costs and risks associated with geothermal development though supporting research, development and validation of innovative, cost-competitive technologies focusing on these areas: Enhanced Geothermal Systems, Hydrothermal Confirmation, Low-Temperature and Coproduced Resources, Systems Analysis. 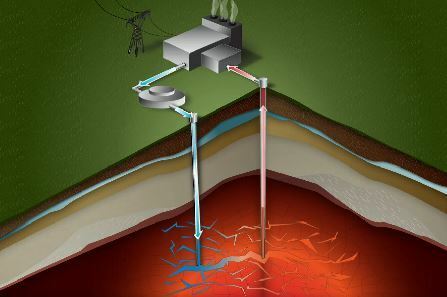 A geothermal resource requires fluid, heat, and permeability to generate electricity. Conventional hydrothermal resources contain all three components naturally. These geothermal systems can occur in widely diverse geologic settings, sometimes without clear surface manifestations of the underlying resource.The Geysers geothermal field in California is still the largest producer of geothermal energy in the world. Read more. What are Enhanced Geothermal Systems? Enhanced Geothermal Systems (EGS) are engineered reservoirs created to produce energy from geothermal resources that are otherwise not economical due to lack of water and/or permeability. 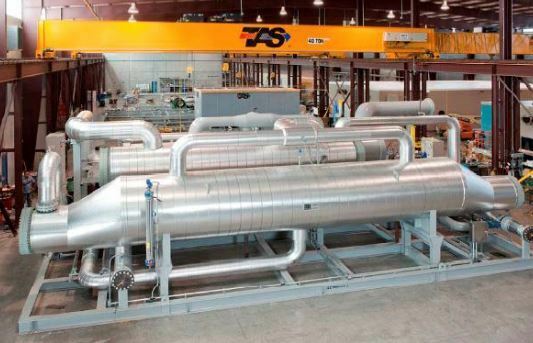 EGS technology has the potential for accessing the earth's vast resources of heat located at depth to help meet the energy needs of the United States. Watch this geothermal video and animation to learn more. What is Deep Direct Use? See how to generate clean, renewable energy from hot water sources deep beneath the Earth's surface. 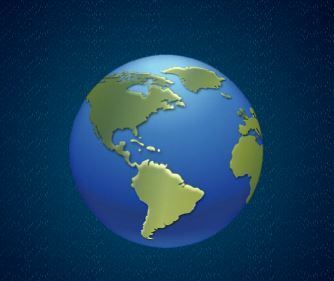 This top ranked Energy 101: Geothermal Energy video highlights the basic principles at work in geothermal energy production, and illustrates three different ways the Earth's heat can be converted into electricity. An energy-efficient heating and cooling alternative, the geothermal heat pump system moves heat from the ground to a building (or from a building to the ground) through a series of flexible pipe "loops" containing water. 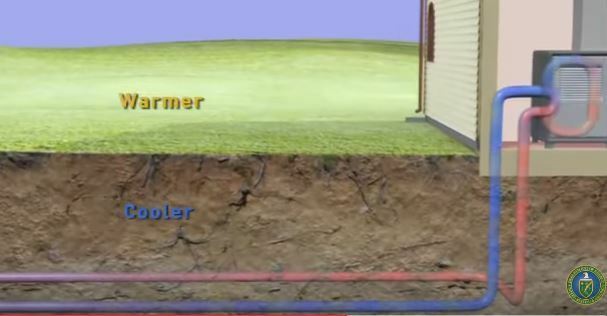 Energy 101: Geothermal Heat Pumps video explores the benefits Geothermal and the science behind how it all comes together. Wells one mile deep or more drilled into underground geothermal reservoirs tap steam and hot water that can be brought to the surface. Geothermal drilling success relies on the integrity and longevity of a geothermal well’s cementation of casings. The well must be stabilized with a casing, a large diameter pipe assembled and inserted into a drilled section of a borehole, to prevent the well walls from collapsing. The gap between the casing and the walls of the well is filled with cement to lock the casing into place. 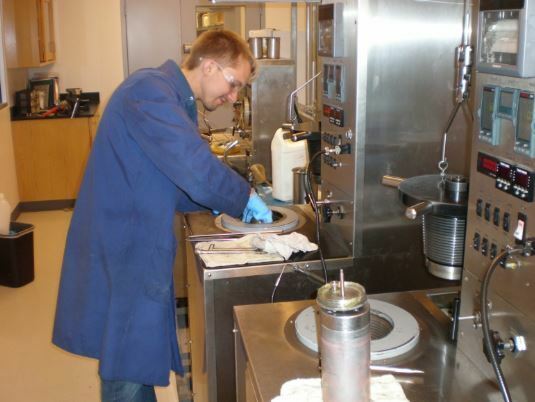 Trabits Group, LLC successfully developed a cement designed specifically for use in harsh geothermal conditions and is easy to use. This innovative cement contains zeolites, a naturally occurring mineral that can be readily dehydrated and rehydrated, to reduce the complexity and cost of well cementing. Read more. 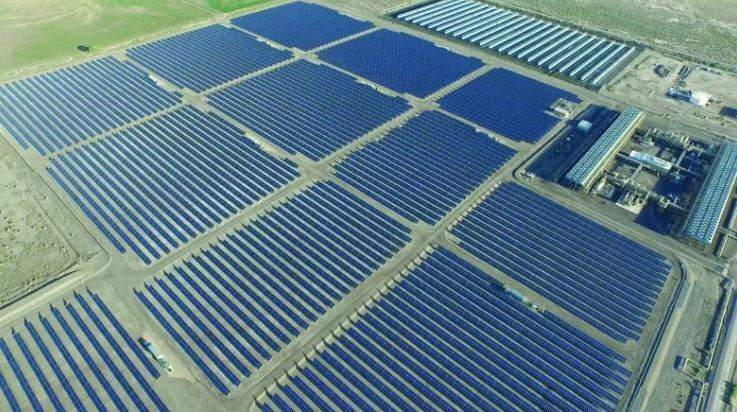 Enel Green Power North America’s Stillwater plant, outside the desert town of Fallon, Nevada, is the world’s first triple hybrid facility combining geothermal, photovoltaic, and solar thermal power generation. 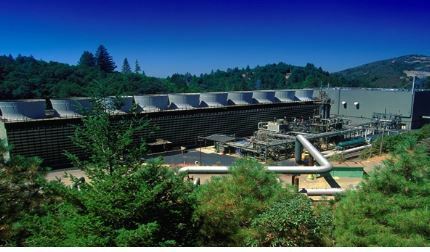 As the first-of-its-kind hybrid plant, this technology has the potential to allow for increased power generation during the middle of the day when electrical demand is generally greatest; to use solar heat to offset long-term decreases in geothermal resource performance; and to leverage geothermal heat to eliminate the necessity for thermal storage, which is required by stand-alone concentrated solar power plants. The newly commissioned plant has the capacity to produce enough renewable energy to meet the needs of 15,000 American households. Read more. "Geothermal can really make a difference in handling part of the energy demand, " says Dr. Susan Hamm, Director of the Geothermal Technologies Office, who notes her top priority is to keep the geothermal technology research and development headed toward the goal of $0.06 per kilowatt hour. Read her interview here. Most power plants—whether fueled by coal, gas, nuclear power, or geothermal energy—have one feature in common: they convert heat to electricity. 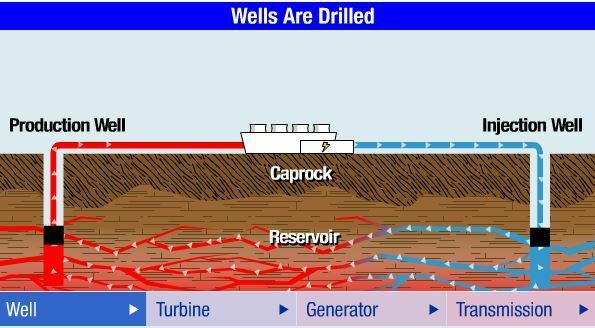 Heat from the Earth, or geothermal — geo (Earth) + thermal (heat) — energy is accessed by drilling water or steam wells in a process similar to drilling for oil.Geothermal power plants have much in common with traditional power-generating stations. They use many of the same components, including turbines, generators, transformers, and other standard power generating equipment. 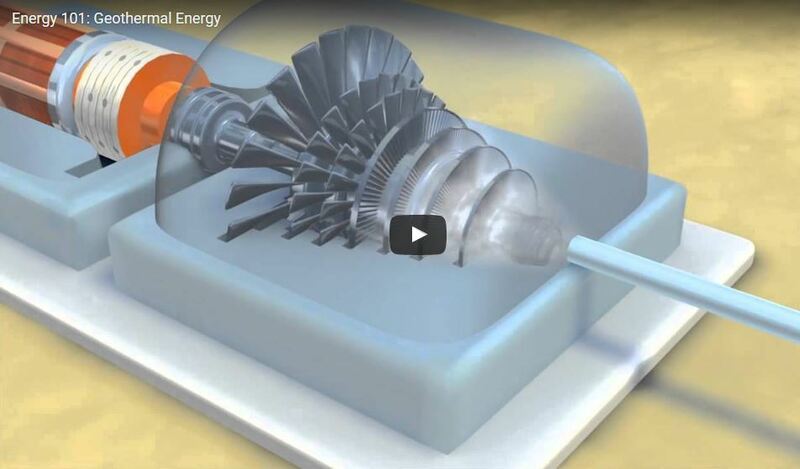 While there are three types of geothermal power plants, this animation shows a generic plant. See animation. In partnership with the Center for Advanced Energy Studies and Idaho National Laboratory, GTO selected the winner of the Geothermal Design Challenge from more than 100 teams of high school and university (undergraduate and graduate) students invited to explore the future of geothermal energy and literally “draw the heat beneath your feet.” For the Challenge, GTO and its partners selected the theme, “What is the Future of Geothermal Energy? How Will It Impact You?” See award winning entries here. Mike Weathers, Project Manager for Geothermal Technologies website, shared the importance of geothermal research in successful development of geothermal resources for new energy opportunities using the Play Fairway Analysis. 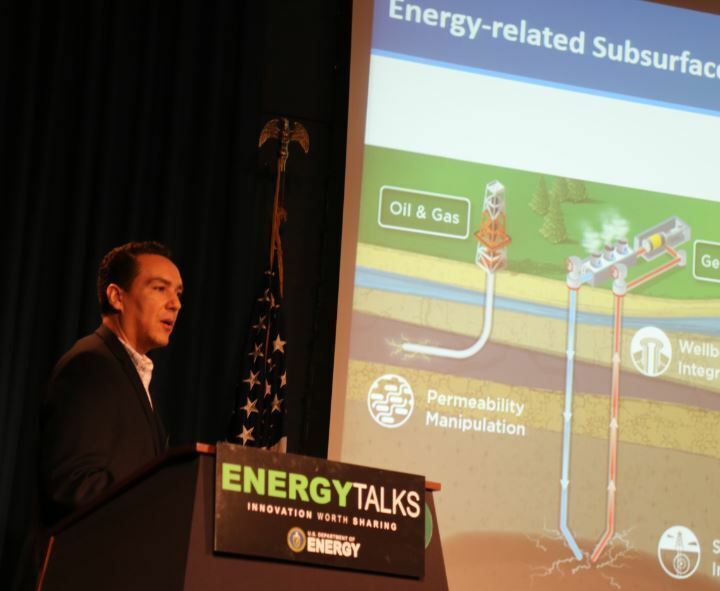 See Mike's Energy Talks, and our 23 other Energy Talks presentations on YouTube or our Energy.gov/EnergyTalks. 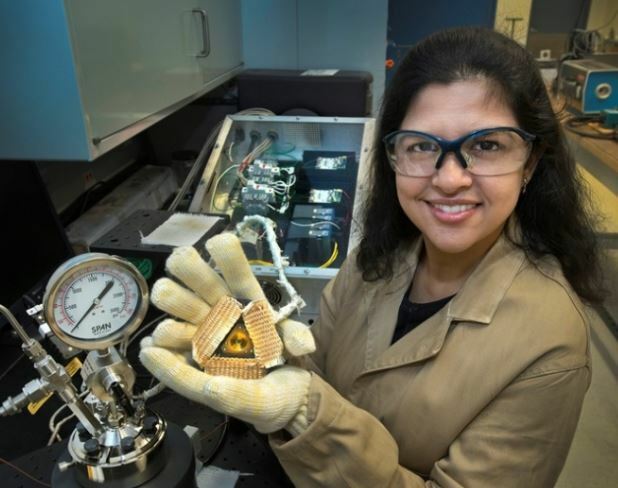 Simerjeet Gill of the U.S. Department of Energy's Brookhaven National Laboratory works on materials in extreme environments, including supercritical CO2. 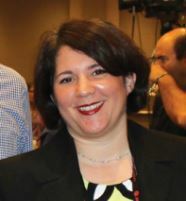 Her research focuses on synchrotron X-ray techniques and microscopy to investigate materials in extreme environments to advance applied energy technologies for nuclear and enhanced geothermal systems. She has developed in-situ reaction cell and has been the lead scientist on a "first-light" experiment to study corrosion in nuclear materials at the National Synchrotron Light Source II. Before joining the Lab in 2010, Simerjeet was a research assistant at Texas Tech University, where she earned her Ph.D in inorganic chemistry. She earned BS and MS from Honours School in Chemistry at Panjab University in India. Read more. The Geothermal Prospector mapping tool provides an excellent data resource for visual exploration of geothermal resources using the tools and datasets required to produce and disseminate both exploration gap analysis and Enhanced Geothermal System (EGS) planning and analysis. The online tool provides the information needed to allow users to determine locations that are favorable to geothermal energy development. Read more. 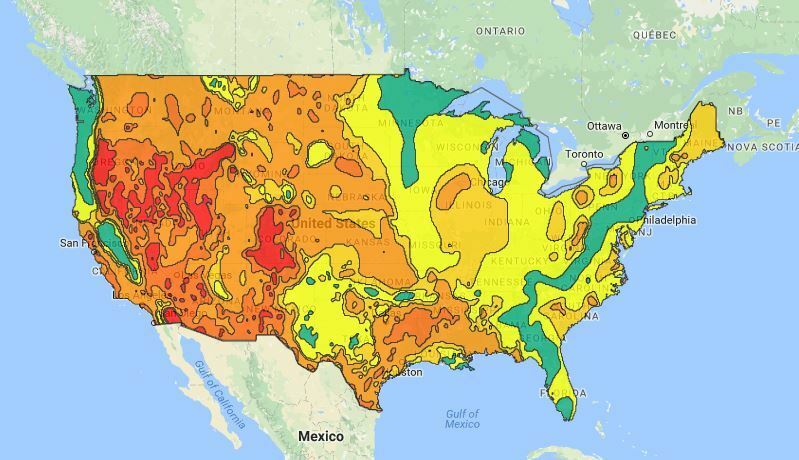 Use the data tool to explore geothermal resources near you.